We strive for a great reaction. Here's what our clients are saying. “Gary, I am so very delighted with the table. Thank you again for being so careful with it, and conscientious about it, and just plain interested in it. It's been a terrific collaboration, leading to a total success, and I couldn't be more pleased -- both with the result, and with finding you in the first place. Hooray! Very best wishes, and enduring thanks!” - Don S.
“[RE]new transformed my great grandparents trunk from a dusty piece taking up space in the barn to a work of art that tells the history of my family's journey from Ireland. Thank you so much, we love it!! !” - Erin M.
“Gary and [RE]new recently refinished/restored 2 pieces for us -they are now beautiful, better than new!!! : ) we are thrilled. Gary is a pleasure to work, very accommodating, work done on time, reasonable prices. Don't hesitate to give Gary a call!!! !” - Debbie R.
“Gary refinished an old drum table that I inherited about 35 years ago. He did an incredible job of bringing that old scratched table back to life. The table came out beautiful and looks brand new. Gary's workmanship and attention to detail is amazing. 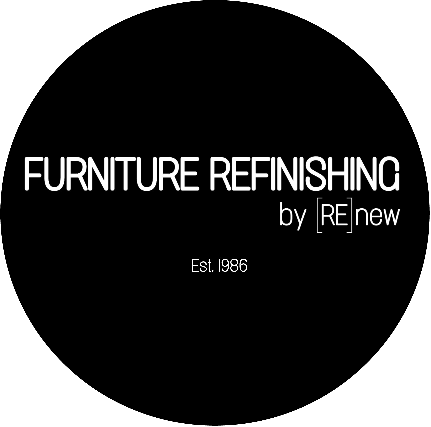 I would definitely use [RE]new again for any furniture restoration project.” - Joanne G.
“Customer Service, Quality, Thoroughness - Gary was wonderful to work with. He offered great suggestions, was timely, and I had an overall positive and pleasant experience. I would definitely use his services again. Thank you, Gary!” - Susan E.
“Gary - Thanks for the beautiful job on my chairs! It is a pleasure to work with you and I look forward to my next project.” -Susan S.